Greyhound Lab Mix - A Guide To The Gorgeous Greyador! Many fans of the Greyhound Lab mix seek a dog that combines the Lab’s sturdiness with the Greyhound’s refinement. But there is no guaranteed Greyador appearance, as mixed breed dogs can inherit the physical characteristics of either parent breed. Some Greyhound Lab mixes can look more like Labs and some more like Greyhounds. While the outcome of a Greyhound x Labrador breeding can be unpredictable, there are a few general characteristics that most Greyadors share. How big is the average Greyhound Lab cross? Greyhound males weigh between 60-75 pounds. Females are 60-65 pounds. The average male Labrador Retriever is 65-80 pounds; female Labs are 55-70 pounds. Expect your full grown Greyador to weigh between 55-80 pounds for males and 50-80 pounds for females. While Labs weigh more than Greyhounds, the Greyhound is generally taller than the Lab. An adult male Greyhound can be 30 inches in height at the withers, while the tallest Lab tends to be under 25 inches in height. The average Greyhound Lab mix dog’s height can vary from 21-27 inches. Size ranges for the Greyador are broad, which is typical for mixed breed dogs. Your dog can inherit features from either breed. Many potential owners of Greyhound Lab mix pups are interested in learning about the possible coat colors and textures of this mixed breed, including the amount of shedding to expect. Labs have a double coat consisting of a short dense top coat and a soft thick undercoat. The undercoat sheds in warm weather. Greyhounds have a smooth, short coat. The Greyhound’s coat is relatively low maintenance and sheds as much as the average dog. The Lab’s double coat makes it a more profuse seasonal shedder, and the breed generally requires more frequent grooming than a Greyhound. The Greyador coat is usually dense, smooth, and short in length. It’s safe to expect a similar amount of shedding and similar grooming requirements as the Lab, given that your dog can inherit the Lab double coat. 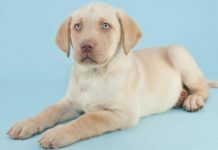 Many potential owners are interested in specific colors like the black Lab Greyhound mix, yellow Lab Greyhound mix, or chocolate Lab Greyhound mix. Solid black, yellow, and chocolate are the only officially recognized Lab colors. The Greyhound has a much wider range of accepted colors and markings. They can be many different colors, both solid and brindle, and a lot of Greyhounds are white with colored markings (parti-colored). Greyhound Lab mixes have more variety in color than Labs, because the Greyhound is so varied in color. 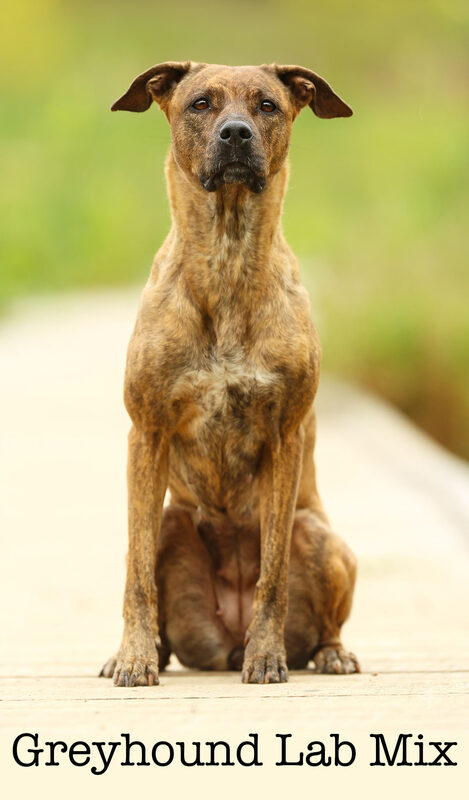 Your Greyhound Lab mix can be solid or brindle, or parti-colored as well. Possible Greyador colors include silver, blue, grey, brown, black, red, and fawn. When browsing pictures of Greyhound Lab mix pups online, you will notice a lot of black or mostly black dogs. The black Lab and Greyhound mix is an especially popular cross breed, but many colors and markings are possible. The temperament of all mixed breed dogs can be any combination of the traits of either parent breed. Every dog is an individual, and training and socialization play a larger role than breeding in giving you the kind of dog you want. While Greyhounds tend to be somewhat quiet, sensitive, and gentle, Labs have a reputation for being active, playful, and friendly. Their fundamental personality differences are due in large part to what each breed was developed to do. Sighthounds like the Greyhound are generally calm and independent dogs. While some Sighthound breeds have aloof personalities to match their noble looks, Greyhounds are famously sweet-tempered and affectionate. One important personality trait to be aware of in Greyhounds and Greyhound mixes is their strong prey drive. They were bred to hunt small game using sight and speed, so all Greyhounds should be tested for prey drive before being introduced into homes with small animals like cats. 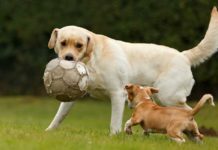 Retriever breeds like Labs are part of the Sporting dog breed group, along with other active and amicable breeds like Spaniels, Setters, and Pointers. Labs are always eager to please and ready to play. The lovable Lab personality is legendary. The Greyhound Lab mix could have an appealing combination of the Lab’s enthusiasm tempered by the Greyhound’s calm. Although it could equally have one or the other extreme. You can generally expect a friendly and non-aggressive dog, especially with proper training from an early age. Make sure you take the prey drive of your dog’s Greyhound ancestors into account when introducing one into a household with other pets. Your dog’s Greyhound blood may also make it a bit more sensitive around boisterous young children than its easy going, rough and tumble Lab ancestors. Be sure to supervise your dog around children. Both the Labrador Retriever and Greyhound dog breeds have known genetic health issues that potential Lab Greyhound mix owners should know about. Dogs that are the result of purebred cross breeding, like the Greyador, may inherit health problems from one or both parent breeds. What health issues are common in Labs? 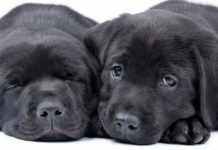 Hip and elbow dysplasia, heart disease, centronuclear myopathy (muscle weakness), progressive retinal atrophy (eye disease), exercise induced collapse, cold water tail, and tricuspid valve dysplasia (malformed heart) are potential issues with Labradors. What are the most common health issues in Greyhounds? Canine genetic experts report several potentially serious conditions seen in Greyhounds. They include: multiple blood disorders, Greyhound polyneuropathy (muscle weakness), superficial keratitis (eye disease), osteosarcoma (bone cancer), hypothyroidism, pemphigus (autoimmune disease affecting the feet and nails), and increased sensitivity to anesthesia, especially barbiturates. Potential Greyhound Lab mix owners should educate themselves about the health problems of both Labs and Greyhounds. The Lab parent must have good hip and elbow scores, be PRA clear and have an up to date eye test. As a minimum the Greyhound parent should be PRA clear and have no family history of polyneuropathy. Your mixed breed dog is not necessarily healthier than purebred dogs if the dog is bred from two purebred lines with known health problems. Knowledge of the health history of your dog’s parents, including written certifications and genetic test results, is key to making sure your Greyador is healthy. There are tests available for many common genetic conditions. Reputable breeders will share this important health information with clients. Interested in acquiring a Greyhound Labrador mix puppy from a breeder? Here are a few common-sense tips to keep in mind as you begin your search. Be cautious of online ads for Greyadors or any designer mixed breed dog. Large scale, for profit breeding operations (often referred to as puppy mills) should be avoided. Since both Greyhounds and Labs are known to have some significant genetic health conditions, the best way to ensure that your puppy will be healthy is to work with a reputable breeder who will share health information with you. Remember that an unusually inexpensive puppy bought sight unseen may cost you much more in long term veterinary expenses than a pricier dog from a known breeder. 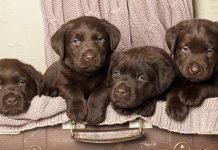 It’s a good idea to choose a local breeder who welcomes potential buyers to their home, so you can see the environment where your puppy is raised. Be sure to meet your puppy’s parents and observe all your puppy’s littermates. 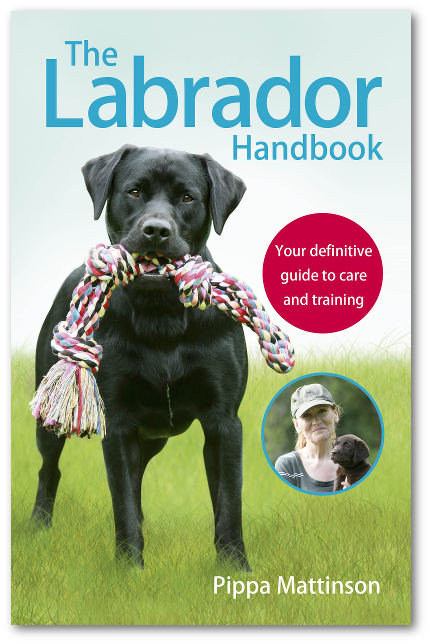 Labradors can be screened by x-ray for hip and elbow dysplasia. There are genetic tests available for certain heart and eye conditions, as well as centronuclear myopathy and exercise induced collapse. Greyhounds can also be tested for some of the serious genetic health conditions that are common in the breed. Experts recommend that, at a minimum, your dog’s Greyhound lines should be tested for polyneuropathy and thyroid, heart, and eye diseases. Genetic tests can tell breeders which of their dogs are unaffected, which are carriers of a disease, and which are affected by the disease. 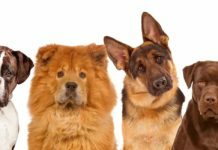 Reputable breeders are concerned about the overall health of the breeds of dog they work with and would not knowingly sell puppies afflicted with a serious medical condition. Greyhound Lab Mix puppies are not as common as some other Lab mixes like the Labradoodle, so be patient and take your time researching reputable breeders. Is it possible to adopt a Greyador from an animal shelter or rescue organization? Most Greyhound rescue organizations work with purebred retired racing Greyhounds. There are many Lab rescue groups around the country, and it’s a good idea to talk to local Lab rescue groups and let them know you are interested in a Lab Greyhound mix. You also may be able to find a Greyhound Lab mix that has been surrendered to an animal shelter. Most shelter pet search websites allow you to search available dogs by breed. Shelters do their best to identify the mixed breed dogs in their care, but you can also confirm a dog’s ancestry through genetic testing. 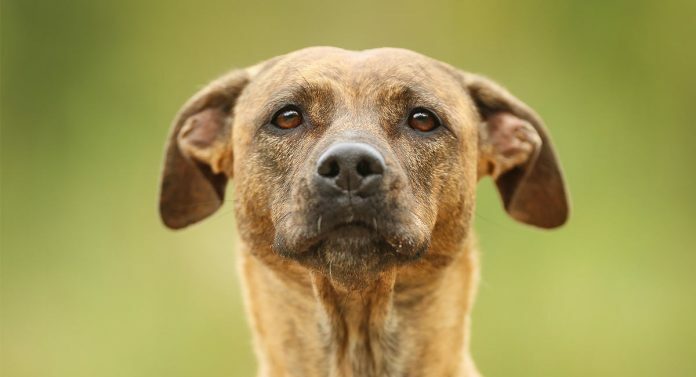 Is a Greyhound Lab mix the right dog for you? The Lab Greyhound mix can be a great pet for anyone interested in a loyal and affectionate canine companion. 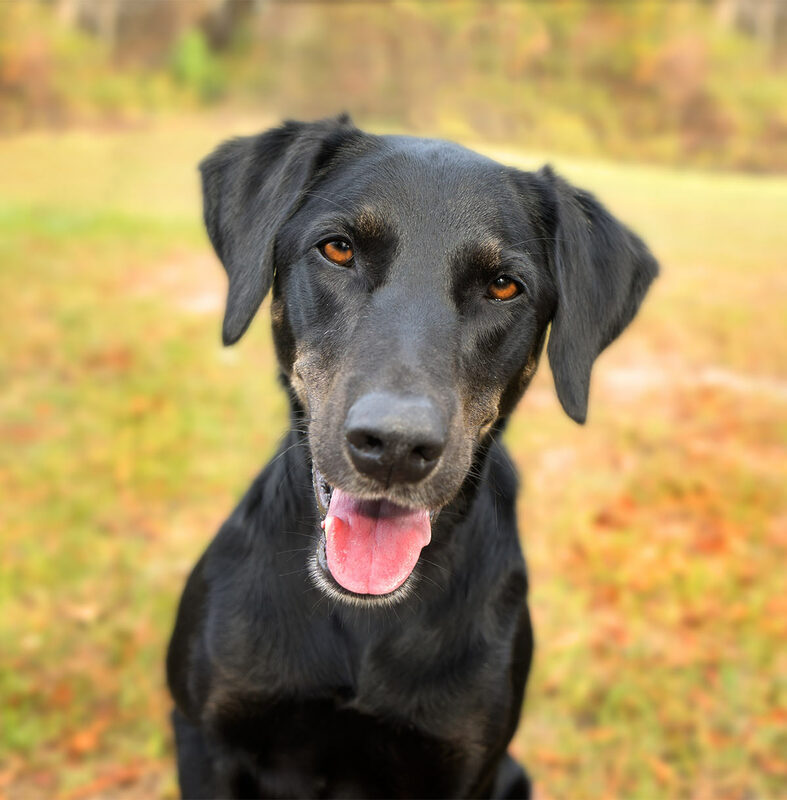 Both parent breeds of the Greyador have appealing personality traits, but it’s important to remember that your dog can inherit any combination of the Lab and Greyhound temperaments. The best way to ensure that your dog is well socialized and well behaved is to start the training process as soon as you get your new Greyhound Lab mix puppy. Less experienced dog owners can benefit from formal training classes like puppy kindergarten so that their dogs get a good foundation from an early age. Labs are highly trainable, and Greyhounds are generally calm, all of which can be very helpful for new Lab Greyhound mix owners. The sturdy Lab and elegant Greyhound can combine into a beautiful medium sized dog with a short coat that can come in a variety of colors and patterns. The result of any cross breeding is never 100% guaranteed, something new owners need to remember. 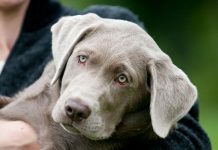 Before you fall in love with an individual puppy, make sure you understand all the possible health conditions associated with both the Labrador Retriever and Greyhound breeds. Choose a reputable breeder who performs health testing and shares the results. Getting a dog is a lifetime commitment, so be sure your new Greyhound Lab mix is as healthy as possible. “Centronuclear Myopathy.” University of California Davis Veterinary Genetics Laboratory. Kittleson, M.D. “Tricuspid Valve Dysplasia.” Case Studies in Small Animal Veterinary Medicine. Zaldivar-Lopez, S., Marin, L.M., Westendorf-Stingle, N., et al. “Clinical Pathology of Greyhounds and Other Sighthounds.” Veterinary Clinical Pathology, 2011. Drogemuller, C., Becker, D., Kessler, B., et al. “A Deletion in the N-Myc Downstream Regulated Gene 1 (NDRG1) Gene in Greyhounds with Polyneuropathy.” PLoS ONE, 2010.